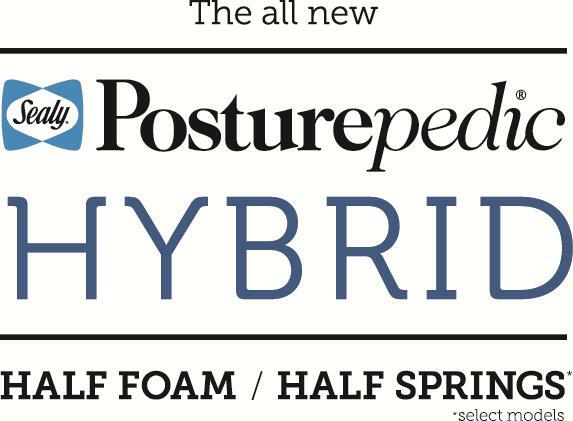 Sealy presents the all-new Posturepedic Hybrid Series, featuring a half foam, half springs design for the perfect balance of comfort and support. Each Posturepedic Hybrid mattress includes OptiCool Gel Memory Foam, the first memory foam on the market to be fused with Outlast high-performance temperature regulation material. The powerful combination of gel and Outlast keeps you at a temperature range conducive to deep, relaxing sleep. Select models also include specialty OptiPro Memory Foam for a premium Visco feel. At the core of each mattress in the Posturepedic Hybrid Series lies an innerspring of new Apex HS Coils. These coils are crafted from durable titanium alloy and individually wrapped in strong fabric. The individually wrapped innerspring design works to eliminate motion transfer between sleep partners so when you move around during the night, your partner doesn't have to. Posturepedic Hybrid mattresses are fully foam encased with the new SolidEdge HD System. Stretch to the edge, enjoying comfortable usage of your entire mattress. If you are ready to invest in great sleep, the new Posturepedic Hybrid Series is for you. Please Note: Pedigo Furniture operates stores in the Livingston, Onalaska, Trinity, Coldspring, Corrigan, Huntsville, TX area. Please contact us for delivery and price information.